New Oricom baby monitor even helps lull baby to sleep! My, how far baby monitors have come. As technology has advanced, companies like Oricom have continued upgrading their range to ensure each new monitor is at the cutting edge. This snazzy new model has some pretty incredible features – like a touchscreen and motorised camera. And it also has a couple of clever little tricks that may just help soothe baby off to sleep. Come and get the lowdown. When my children were little, I was a bit of an ‘over-checker’. I always felt I couldn’t quite see what they were up to by looking at the grainy image on the baby monitor. Or I was convinced it wasn’t picking up every noise. 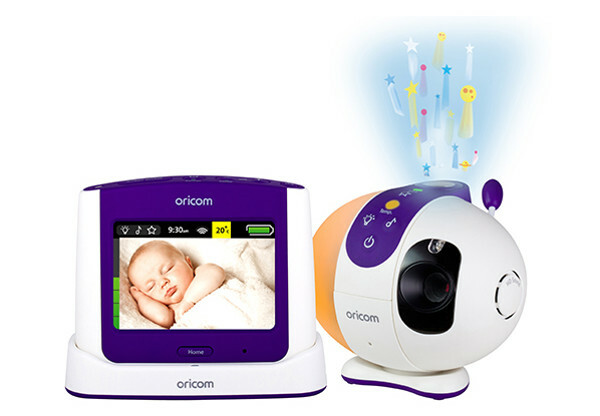 This beauty, which has just been launched by baby monitor expert Oricom, eliminates any guess work. Crystal-clear, sharp video images, a camera that pans and tilts, night vision and high-definition sound – it ticks every box on my ‘over-checker’ list! Let’s start with the most important aspect – the screen. The Oricom Secure870 has a screen with a diagonal measurement of almost nine centimetres! But it’s not just any screen – it’s a touchscreen, with a resolution of 480×320, and a three-times digital zoom. Those specs mean you’ll have no trouble seeing your child, even at night – thanks to the baby-friendly night vision. I mentioned earlier there are a couple of tricks this monitor has up its sleeve, aimed at helping soothe a tired baby. The first of these is the brilliant parent talk-back feature. You can offer some words of comfort or reassurance remotely, or you can make your child aware you know exactly what they’re up to! In fact, it’s the kind of gadget you’ll use even when you don’t need it to keep an eye on your child – it’s a great distraction and settling tool, with its 19 built-in lullabies, white noise function (vacuum cleaner or hair dryer, anyone? ), nature and womb sounds. Plus, it can even project a mesmerising starry light show on the ceiling to help your baby drift off to sleep. The Oricom Secure870 will also let you know the temperature of your baby’s nursery, has an adjustable night light, vibration alerts and is wall mountable – so you can keep it safely away from little hands. The parent unit has an in-use time of up to six and a half hours, and if you want other cameras around your home, it can be connected with up to four additional cameras, which are available for purchase separately. Take a closer look at how it works in our recent Babyology video review. It’s pretty easy to see why the Oricom Secure870 has been dubbed the ‘ultimate’ baby monitor – it does the job of so many other devices in one compact unit. It retails for $359, and can be purchased directly from Oricom.